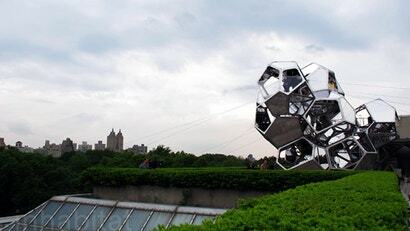 Yesterday, atop the Metropolitan Museum of Art in New York City, artist and architect Tomas Saraceno debuted his most recent work: Cloud City. 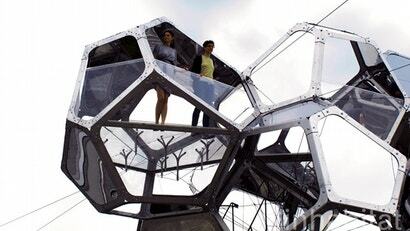 A spectacular sculptural constellation, Cloud City is a mirrored fun house of geodesic pods, open to the public, with a number of prime vantage points for taking in the expansive Manhattan skyline and greenery of Central Park. The structure weighs approximately 18 tonnes and is anchored to the museum's roof by a complex rigging of steel cables. 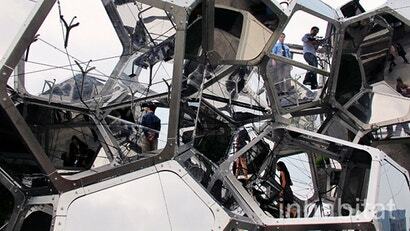 Cloud City can accomodate 15 people at a time, 13 museum patrons and two Met monitors. Rubber-bottom shoes are mandatory. The artist took as his inspiration a number of natural phenomenon, including clouds, bubbles, bacteria, foam, universes, and social and neural communication networks.